Economic Research Service, U. S. Dept. of Agriculture. Ceased publication in Apr. 1975. Issued by: U.S. Bureau of Agricultural Economics, 1936-Oct. 1953; by: Agricultural Marketing Service, Nov. 1953-Mar. 1961; by: Dept. of Agriculture, Economic Research Service, May 1961-Apr. 1975. 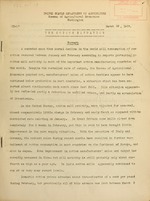 Issues for 1936-Oct. 1953 published by the U. S. Bureau of Agricultural Economics; Nov. 1953-Mar. 1961 by the Agricultural Marketing Service; May 1961-Apr. 1975 by the Dept. of Agriculture, Economic Research Service. run at or very near record levels. 18,900,000 bals harvested during, th- curr. :r.t season. ficiently above a year earlier to offset the reduced world production. slightly but varied within a range of less than on -frurth cent. ..nd cutLpu- continued :misty unti-r-rable. below February- 1937 and 3S p.rc.-.r:t below the 10-year vr.gr- -:- for tie t!onth. responding p.-riod in the prtlcoe.rng season. might have had on exports. wvre frcm 8 to 60 percent less than in Febru:..r 1937.
and the first 3 -":c-cks of Mlarcn. approximately 25 percent bolo- actual consumption in 136-37.
fall short of the comparatively high consumption of 1936-37.
in the utilization of "cell-wool" by spinning mills. Kingdom supplied by C. C. Taylor, Agricultural Attache, London. larger then yiear e:irli,:r, but in Fcbrusary was much lower than in 1957. The number of0 workers employed in January mas the sr.iIllest for many years. percent les. t.an a y. -r rlicr and the smallest since prior to 1900.
we're 10 percent l.;-s th-n 1st y:-:.r. still bclo-. l:st year's level. as compared with August-January 1936-37.
persists in a lar"e niu'aLer of .-ctt'r t_'-ti- l aud textile products. 1/ Estimated; roughly P8C perc-nt of drinestic production. in textile 'u:.ort sal'cs for l:-itr delivt ry. during the first 7 monts- of ti.e current season. maintained at a level considerably above any of the past several yNars. April 1937, unfilled orders have fallen cr.astically below a year earlier. in part by the pick-up in yarn exports during 1937, as compared with 1936.
creasing andi unill]. :i rders bein-! fur thr reduced. lower than in tle first half. whilO above a year earlier showdr .- correspondin.- increase. 11,023 pounn's '-,illy but pro.--; tio is to be increa-se, to 44,092 pu".:ds. production of re-,aneratoc. .- ttt.:n. It-.. '- It-alitn: cotton mill tivlty seems to 'a-v, c .ntinu'. lo:-I. for t'L: cotton trade, t.h-reof r,-, sconn di sinctiy less promising '.nr. in: nreco '.i x., i :1I-nti'is. yoarr norrn-.ly aver"-sed C76,000 to ,,400 bal. rc p- y:r.
trini-- the greater part of 1936. T:i- revival in, r., .ti -nal tr-.l 0. iri-n.
d'-..an.i for Italian . ; ,' or th, 3 : :. 'P.lation :f the lira in October 1 . / Informatin received fro,: the A:.icric-'. Consulate, :ilan. art Ti.cr" bi. t-.c tal -, c ''. un ie., ",t, Ar-nt . :a, Turkey. proper fe.l rJ: abcut 300, b 0 ':lo -.l ir. 103- to 271,700 bl.3s ir. 137. V-}.i: are ct.an 1 fitor (or L "c.l-- i. "c-ttunizOd"
c'ttor. must eto .nsur': 1.
ponding period of last season but larger then any other like period in history. increase, the exports for January were the smallest for the month since 1933. Kenneth C. Krantz at Osaka. able regarding the means of maling these suoidies. partial operation of thesa mill.3 probablyy will be resumed this fall. March owing to inc-r. sec- imaar. front South '".ina ports, cspec illy;Canton. season probably was larger than in any- like period in history. crop prospects usually become of increased importance about this time each year. Bureau of Agricultural Economics dated March 12.
crop will be cons-i: erably smaller thLn the record production of 1937-38.
domestic crop still be very nuch smaller than that of 1937.
be lower than a yenr earlier. the carry-over may entirely offset the reduced production. 1,336 3 60 1,293 96.